Over winter, I made the long journey south to the land of Texans, with aspirations of bikepacking around Big Bend State Ranch – just across the river from Mexico. The full story has just made it into the glossy pages of Singletrack, an independent mountain bike magazine out of the UK. It’s a 2500 word tale spread over 8 pages, fleshed out substantially from the original blog post. I hope you enjoy it. 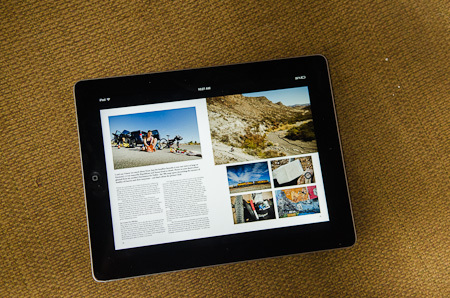 There’s lots of cool stuff in this issue, including a great feature on urban UK riding, a profile on 29er pioneer Wes Williams and musings on the impending 650B wheel phenomenon. Steve Worland’s pieces are always a favourite of mine. You can download the latest magazine as a pdf (best to click on ‘two pages’ in the view option), or buy it from the App Store in itunes. 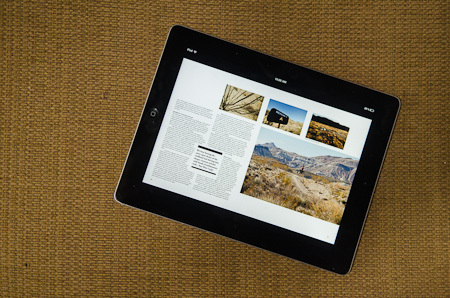 The Singletrack App is £2.99 (or $4.99), and that includes any chosen copy of the magazine – Issue 73 is the current one. Or you can order yourself a lovely print version for £5. This entry was posted in Journalism, Texas and tagged Big Bend State Ranch, Singletrack Magazine on April 26, 2012 by Cass Gilbert. Very cool, thanks for passing this along. After following this blog for the last few years it made a great change seeing one of your posts in print when it hit my doormat the other day, great stuff, great mag! Cass,Great photos, write up and inspiration, as always. Speaking of inspiration, must be many ( like me ) who dream of hitting the road for months at a time and are seriously thinking of making it a reality. I get all of the bikey stuff but if you don’t mind me asking, how exactly do you manage money on an extended trip like this? I mean do you carry cash? Use a credit card? bank transfers? A combo of everything? Just wondering how it works to be far from home and needing to have enough finances for food, transport, necessities etc. over an extended period? How exactly do you do it? Do you have a support system back home when you need it or do you carry everything?Haven’t been able to get my head around this so how about spilling the beans? My honest experience is only being on bike trips that last for two or three weeks at a time at which point I usual run low on funds and have to find a town with a bank where it can often be a real hassle just to cash TC’s! If there’s a secret formula for dealing with this, I’d love to know before starting my world tour! Congrats on the Singletrack article! Just got my Surly Troll built at long last and it rides just great.Can’t wait to take it on a trip this summer. No real secret… I have an online bank account, and I draw out some cash here and there from ATMS, of which there are plenty. I budget for about $10 a day; food, plus mainly camping (free) with some dorms/guesthouses ($5-8). I eat cheap local food or buy stuff from shops/markets. I only have one direct debit card (a second may well be wise) and if there’s a problem, I phone the bank (Barclays) using skype, which is super cheap. So far, so good. I rely on ATMSs. No TCs. I try and carry some emergency dollars too (for this part of the world) which I stash away elsewhere. A couple of hundred dollars generally lasts me 2-3 weeks, depending on how many cities/wild camping ratio. I normally take between $100-200 at a time, depending on where I’m headed, and where the next ATM is likely to be. That way, I never have too much cash on me, just in case. That’s about all I can think of right now!